DVD in a beautiful DVD-sized Digipak with soundtrack CD. All regions. NTSC. 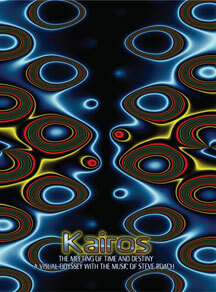 A tour-de-force of visual music alchemy, Kairos is a dynamic flow of visual wonderworlds created by five master light, film and digital artists. Drawing from a spectrum of visual techniques, micro and macro worlds meet up in symbiotic flow between sound and visuals that can only be described as mind-expanding. The soundtrack was shaped within the live and studio setting over the past 6 years. The mythic and archetypal power found in Steve’s music and the visual core it stimulates is vividly brought to life in Kairos and is – without a doubt – both musically and visually, a pinnacle moment in Steve’s shapeshifting sound and visionary-inducing works. Featuring visuals from Lynn Augstein, Steve Lazur, Steven Rooke, John Vega, and John Wadsworth, with hybrid visual creation and final editing by Roger King.